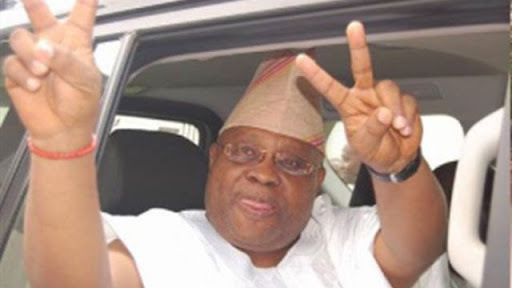 Reprieve on Wednesday came the way of Senator Ademola Adeleke, the governorship candidate of the Peoples Democratic Party in the September 22 poll in Osun state, as the Osun state High Court sitting in Osogbo dismissed the suit challenging his elligibility to contest in the poll. The judge affirmed that no case of cerificate forgery was established against the Senator. In his ruling, the Judge who cited several previous rulings on similar cases explained that Senator Adeleke is qualified to run for the gubernatorial position having satisfied the requirements of the 'Section' (177) Subsection (D) of 1999 constitution of Nigeria as amended. According to the details of the section mentioned above, any candidate seeking election into the highest political office in the state must be a citizen of the Federal Republic of Nigeria, be a member of a political party and be sponsored by the party as well as being educated up to secondary school level or its equivalent. The judge who first struck out allegations bothering on forgery clarified that all documents presented by the defendant are genuine, noting that the case of forgery did not exist anywhere. He also stated clearly that Senator Adeleke having fulfilled the requirements of the law is qualified to run as the case against him lacked merit, and thereby dismissed the case. In his reaction, the counsel to Senator Ademola, Lekan Olayiwola described the judgement as a victory for democracy ,affirming "We are vindicated. While commending the court for upholding the country's Judicial values,Olayiwola urged members of the public, e to keep supporting and vote for the candidate of the Peoples Democratic Party (PDP) Senator Ademola Adeleke as the governor of the state in the September 22 election. Meanwhile, following the this judgement, Adeleke has appealled for peace and unity within the party,affirming that the judgement which is a victory for good people of Osun State, should energise the party for resounding victory in September. The PDP flag bearer called on those who took him to court and other aggrieved groups to forget the past and join hands with his team to dislodge the All Progressive Congress in September. He said, "Today's judgement is a divine window of opportunity for all members of PDP in Osun state to unite under this victory umbrella.I extend hands of fellowship and brotherhood to all aggrieved party members oi including those who took me court. Let us move forward.
" Political contest cannot be without grievances. We however must act beyond personal interests to consider the burden of leadership placed on all of us .Our followers are worried ; they are fed up with the bickering and mudslinging. Now that all doubts have been cleared and rumours laid to rest. Let us now commence the active and arduous task of aggressive campaigning. We are all stakeholders in this victory and coming victory in September by the grace of God!
" The suffering people of Osun state are patiently waiting on us. They know PDP is the only party that can stop the continuation of inhuman government and end the legacy of poverty. The voters eagerly and earnestly look up to us, the expectations are huge. I urge that we cannot afford to disappoint them",the governorship hopeful said.